Nicole Richie was recently in Sydney, Australia to open the MidCity shopping centre, whilst in Oz Nicole spent some time with Grazia Australia. Nicole Richie wears Wheels and Dollbaby leopard print cardigan. Nicole Richie on MidCity: " I think MidCity is really great – it’s the place to go for high-street brands. Forever New is fabulous and I love ksubi, and sass and bide, and all those brands at General Pants. “I’m all about fashion, so I was excited to come out.”"
Nicole Richie on this seasons must-have : "I would say a really great, chic peacoat never goes out of style." 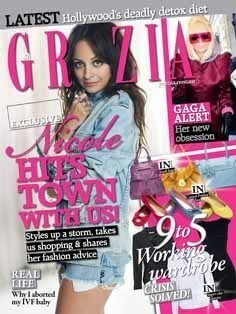 Nicole Richie wears Ksubi studded jacket and cut off shorts from General Pants Co.
Alternatively to read the full story go buy Grazia magazine on newsstands now!